The scenario above displays the strong disjunction between knowledge and justification. Say that there are a million lottery tickets and you buy one. 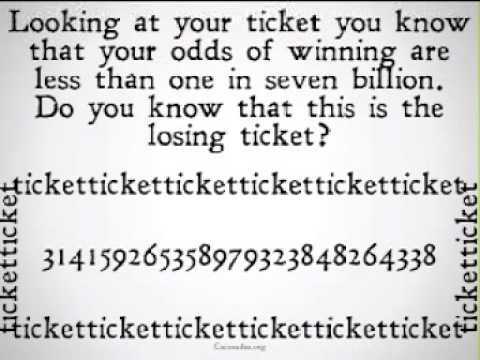 It's possible that you could win the jackpot. However, you'd be profoundly justified in believing that you'd loose. Though you wouldn't have knowledge that you'll loose because you may, after all, win. So why not say that you'll probably loose, rather than that you will loose? This introduction of probability still involves the notion of justification. If it's highly probable that you'll loose, then you're justified in that belief. That still doesn’t make the claim that you'll loose an example of knowledge. It's not just a case that justification in this particular example (about tickets) isn't good enough: it's the case that no “justification [would be] good enough”. There's no limit-condition in which justification suddenly turns into knowledge. Knowledge and justification, in this case, are torn asunder. In this example, knowledge isn't adequately justified opinion or belief. Knowledge and justification are therefore two different epistemic kinds. So instead of thinking that adequate justification will give us knowledge, perhaps we should (in some cases defined by context) simply throw justification overboard. Or, as David Lewis puts it, “justification is not always necessary”. Lewis gives his own examples of knowledge that doesn't require justification. Our use of perception in the past justifies our use of perception in the present. Yet, of course, this is a circular argument. We're using past successful instances of perception to justify our use of perception in the present. However, if we hadn’t justified past uses of perception, then present uses wouldn’t be justified either. It might have been the case, of course, that the past uses of perception were indeed justified by past past uses of perception. And if that’s the case, we have a regress on our hands. A regress that perhaps goes back to our initial acts of reliance on perceptions which weren't justified. Exactly the same remarks hold for our reliance on memory and testimony. Past uses of memory have proved to either correctly represent past actualities or to have helped us cope with past actualities and exigencies. Though how do we know that those past uses of memory were in fact correct representations of past actualities? Was it because we thought the same about past past uses of memory? He argues that we know things even though “we don’t even know how we know”. It could be the case that we don’t actually have “supporting arguments” to justify our knowledge-claim: we've forgotten them. This means that at one time we had supporting arguments for P; though now we’ve forgotten them. P was justified at time t1; though it's not justified at time t2 (the present). However, if P was justified at time t1 (that’s if it was adequately justified), then perhaps it needn't be justified again at t2. This may be a question of time constraints or epistemic commonsense. If we had to re-justify all our bits of knowledge again and again, then we wouldn’t have time to acquire new bits of knowledge or even function in the world. For example, I firmly believe that Adolf Hitler was the dictator of Germany in the 1930s. Indeed I believe that this is a knowledge-claim. However, I haven’t justified this particular belief for some considerable time (for years). Perhaps other beliefs of mine are dependent upon or related to this belief about Hitler. I might have derived other beliefs (or bits of knowledge) from this initial belief. However, if I need to continually re-justify my initial belief or beliefs, then I wouldn’t get around to justifying the beliefs that are dependent upon (or related to or derived from) the initial set of beliefs (which were, after all, justified at one time). Perhaps this is an argument for either some kind of foundationalism or for coherentism. It could be foundationalist in the loose sense that I rely on certain beliefs not being continually re-justified in order to make way for new beliefs. However, the initial set of beliefs were in fact fully justified at one point. That means that they won't come under the old epistemological rubric of “self-evident beliefs” (or “unjustified basic beliefs”). The argument can also be deemed coherentist because new beliefs also depend upon - or are related to/or are derived from – an initial sets of beliefs; which may, in turn, depend on new beliefs and other sets of initial (or older beliefs). Indeed the initial set of beliefs may depend upon other sets of initial beliefs just as much as they depend on these older sets of beliefs. This is a clear coherentist picture of the inter-relations between the whole set of beliefs. In this whole there are no genuinely foundational beliefs which take the weight of all the non-foundational beliefs above them. It's a coherent system of mutual support without a pyramidal structure. Lewis, David. (1996) 'Elusive Knowledge'.